Have you ever met someone who wears ‘busy’ like a badge of honor? Stop wearing crazy busy like a badge of honor. It’s crazy town, and when you do it, it makes you look like you’re out of control. It’s not helpful. What you really need it to schedule rest and recovery. That’s right. Paying attention to you personally means being committed to rest and recovery. It will actually make you a better leader. Rest and recovery time helps you increase accountability, increase productivity and ultimately increase profitability. When you have a big upcoming deliverable, meeting or project due, schedule recovery days to take afterward. Schedule it in in advance to ensure you take it. Mark your calendar to avoid the temptation of accepting meetings and other work-related requests. 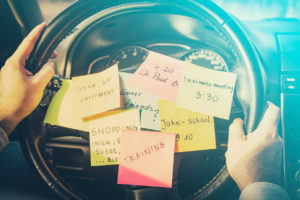 Scheduling vacation time or recovery days is also a great motivational way to help you remain focused knowing there will be downtime afterward. However, your company allocates days and PTO, take the time off. Stop being so proud of the fact you don’t take vacation, or believe you’re a martyr whose company can’t afford to do without you for a few days. That’s nonsense. That doesn’t serve anybody and it certainly is not role modeling what you want for your team. Everyone looks to you as the leader to set the example on this matter. Perhaps you can’t take all your PTO at once, but could schedule mini vacations or long weekends. You could also consider making a long weekend even longer with an extra day or two off. Another idea during the summer is to encourage your team to have summer hours, leaving a little earlier and taking Friday’s off. At the beginning of the year, plan trips and time off throughout the year. Consider also scheduling personal hobbies, trips and adventures as something to look forward to as well. These little nuggets of fun can keep you excited and focused on something not work-related to encourage you to maintain high levels of energy and focus throughout the year. Want more ideas? Check out my video and then subscribe to my YouTube channel for more ideas and ways to pay attention to what matters most. Three ways you can build in rest and recovery. What would you add to this list? Write your comments down here below. If we’re not connected on social media, let’s do that. Follow me on Facebook, Twitter and Instagram. Pick up a copy of Attention Pays, with hundreds of strategies to apply personally, professionally and globally. As a leader, you role model how others will look for what you do for rest and recovery. It is my belief that when we pay attention, attention pays.